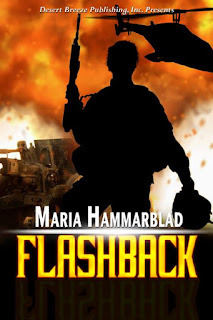 A few days ago I asked a friend to read Flashback (TBR June 21). Desert Breeze has some fantastic authors and editors, and whether they like what I write or not, their input makes me better. She sent me these kind words, and it made me so happy I have to share the message! "I just finished Flashback and stayed up way too late and even skipped an activity because I couldn't put it down. Maria, you have written another great story full of wonderful characters, dramatic plot twists, some moments of true terror, and a love that grows and fills the story and makes getting through possible. Great book!" That made me bounce up and down and clap my hands. Happy Joy Joy! He is more than surprised when he wakes up in a bright and merry bedroom that turns out to belong to the widow Anna, a woman he has rudimentary memories of meeting. Knowing he should leave isn't the same as doing it, and before he knows what's happening, he finds himself pulled into a world with real life problems, such as folding laundry, and what's for dinner. Whiskey is no longer his first priority, and not being alone in his waking nightmare is a relief. That is, until Anna disappears. Steve finds himself forced to return to Afghanistan, a place where he'll have to face both external enemies and himself.